Bell Says Desktop Manager for Mac Due Out Tomorrow... Update: Errrr... NOT!!!! 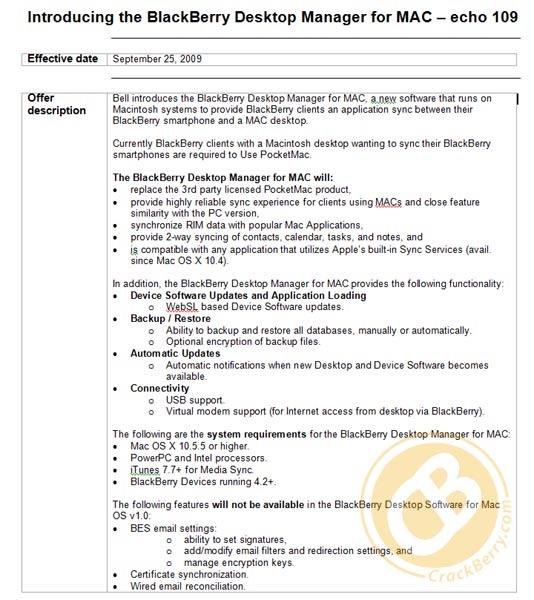 We got a hold of an internal document from Bell and it shows, what was already put out there a couple weeks back, that Desktop Manager for Mac will indeed be released tomorrow. Mac users have been getting by with a leaked version so far, but it will soon be an official release. 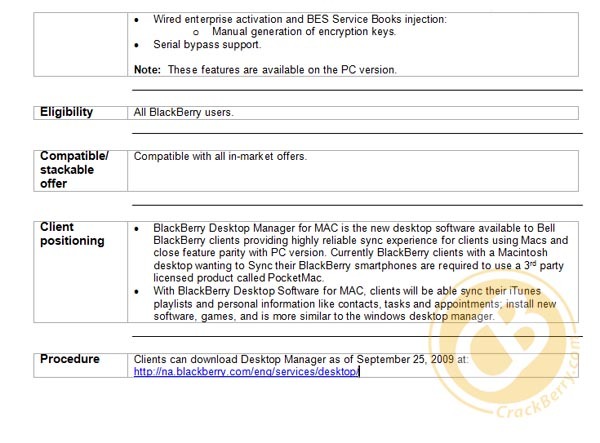 This internal doc shows an outline of the included features, as well as an availability date of September 25th. We're not sure exactly what time the software will be released, but we should see it before the end of the day Friday. Check out the full page for details below. AND... on the off chance we don't get some Mac-DM love from RIM tomorrow, Kevin recommended everybody get their pitch forks out and sharpened up... we'll meet at RIM's doorsteps in Waterloo at midnight!